After that bitter, seemingly endless campaign season, aren’t we all in the mood for something sweet? At Theo’s, the team has cooked up a super cool collection for the holidays sure to melt the hardest heart. It’s called Mirepoix and it’s a collaboration between Theo’s chocolatiers and students from FareStart, the wildly successful program that provides job training for the homeless. This project walked students through the steps of candy-making, including experimenting with the savory ingredients in a traditional mirepoix: carrots, onions, celery, tomato, thyme and parsley. The results just might blow your mind and confuse your palate just a little bit. Hmm, are those really caramelized onions in there? Oh, and roasted carrots seasoned with coriander? So weird and wonderful, but mostly wonderful. After all, we’ve been eating salted caramels for forever. (Thank you Fran’s!) Why not take the savory and sweet contrast to the next level. Especially when it’s for a good cause! 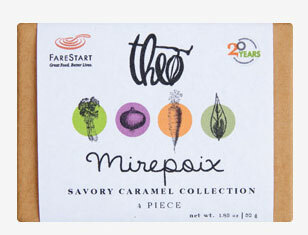 A portion of the proceeds from the sale of this box of four caramels goes back to FareStart. They’re available at Theo’s retail store in Fremont and online. It’s one of the too-few places around Seattle that sells the exceptional Lesley’s Gourmet, chocolates, fruit bars and chutney hand-crafted in Bellevue. And when I stopped in for a post-lunch pick-me-up, the nice lady at the counter advised me to try the just-in truffle. Oh. My. Dear. 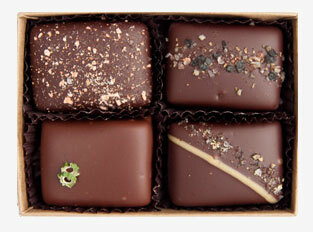 The truffle hit that perfect balance between sweet and bitter, any edges rounded off by its luxe creaminess. It's the kind of life-affirming bite that causes you to make embarassing moaning noises in public. After savoring that treat, the rest of my day was a whole lot nicer. Go get one!